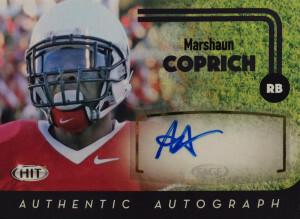 Marshaun Coprich is an interesting prospect whose behavior off the field marred a solid college football career. A productive player for ISU, Marshaun had gaudy numbers for the Redbirds, running for over 5,200 yards in his four years for the university. Unfortunately he got busted for selling marijuana, and although he was a first time offender, prospective NFL teams look down badly enough on users. While he is small (5’8″), he clocks in at a solid 207. Coprich was considered by teams who were looking for him to make things happen in space, to be a change of pace back on 3rd downs, or be relied upon to create mismatches splitting outside. There have been some comparisons to guys like Darren Sproles, but scouts are a bit more conservative, saying Marshaun is more like Jacquizz Rodgers. Going undrafted, the Indianapolis Colts took a very long and hard look at him during private workouts in the offseason, but he ended up signing with the Giants. He did not make the team and later was signed to the BC Lions practice squad.